We have seen quite the drastic change in temperatures across the Tri-State over the last 24-hours. Literally went from Spring to Winter. 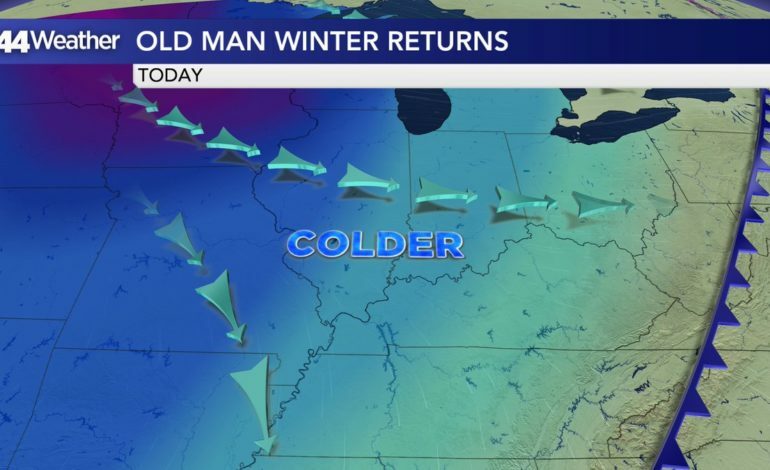 Seeing a 35 to 45 degree temperature drop with temperatures in the 10s and 20s. Wind chills have been in the single digits as well. Sunshine has returned after a rainy and stormy week. 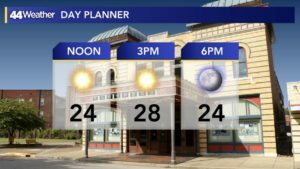 Despite that sunshine highs will reach the mid to upper 20s. Another cold night on tap, starry skies and temperatures falling into the low TEENS, wind chills by Saturday morning will fall to as low as 0 and even below zero wind chills are possible in far northern areas of the Tri-State. Mostly sunny skies will continue through our Saturday afternoon with highs reaching the mid 30s. 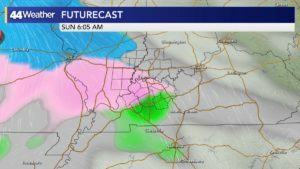 Clouds will increase late Saturday and a system will spread some light wintry mix early Sunday morning, at this time, the precipitation looks like and we’re not expecting anything in the way of accumulations as warmer air will work into the area, temperatures are expecting to rise above freezing. Light rain will be with us for most of Sunday. As we start next week a stronger storm system will move in and we’re looking at more rainfall from Monday-Tuesday. 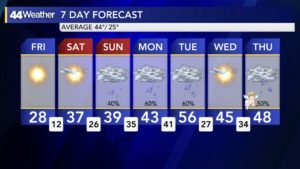 Could see another 1-2″ of rain as temperatures move back into the 40s to mid 50s by Tuesday.